The rock bass is a stout little sunfish with a red eye. They were introduced in Wyoming and found their way downstream in the Tongue River drainage of southeastern Montana, which is presently their only known locale. Montana is apparently too cold for these 6-8 inch sunfish to thrive, and they are of little importance in this state although they are popular panfish elsewhere. All of the sunfishes are important forage fish for northern pike, walleye, and bass. Studies on Tongue River showed migration movements into Otter Creek late May - early June. Probably related to spawning. Pools of rocky-bottomed streams; rocky shallow areas of lakes. Seeks moderately warm water. In Montana, found only in Tongue River Drainage. Eats many kinds of aquatic insects, crustaceans, mollusks, and small fishes. Do not commonly exceed half a pound in north waters. Montana waters are marginal for this species. Sexually mature at 2 - 3 years. Spawns May - June in slow current over gravel bed. Eggs and fry defended vigorously. 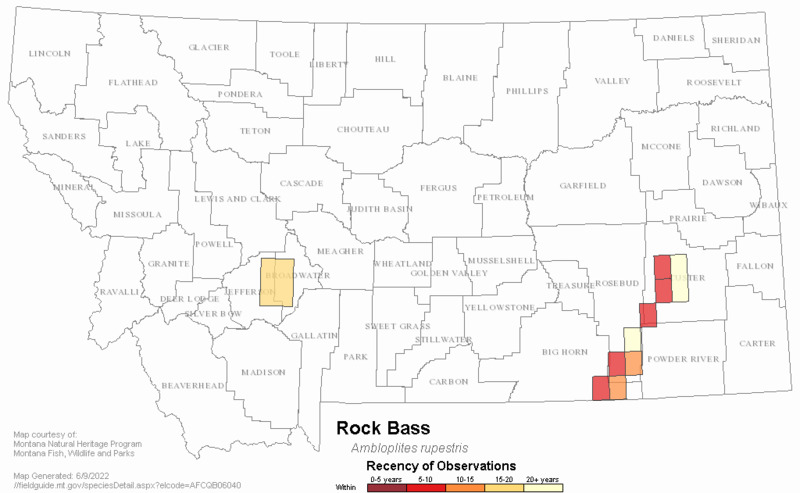 Web Search Engines for Articles on "Rock Bass"